First, the weight of the evidence indicates that, on average, there is a positive relationship between K–12 per-pupil expenditures and student outcomes. Second, the effect appears to be stronger in lower school grades than in upper grades. To arrive at this conclusion, WSIPP researchers looked at historical K-12 funding data from Washington and around the country. 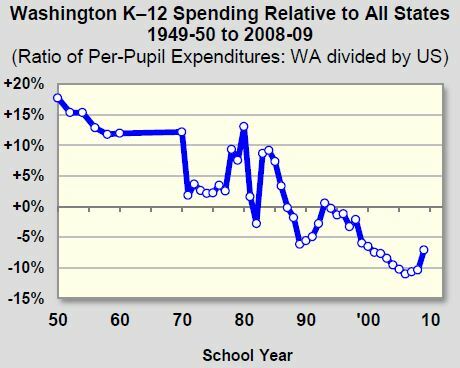 Overall, they found that while Washington’s inflation-adjusted per-pupil spending had increased since 1950, its rate of increase had been much lower than most other states (see graph at right). Translation: yes, funding matters. These evaluations found that especially among lower grades,more funding led to better outcomes in standardized test scores, high school graduation rates, and dropout rates. WSIPP estimates the practical magnitude of a 10% increase in spending would be a long-term improvement of 3.7% in graduation rates. This isn’t breaking news, especially for teachers and administrators who see the effects of state budget cuts in their classrooms and school buildings first-hand. But it is an important reminder that adequate funding for K-12 education – which often receives second billing to buzzwords like “flexibility” and “innovative approaches” – is critical to better educational outcomes. *Created by Washington’s Legislature in 1983, the Washington State Institute for Public Policy (WSIPP) carries out “practical, non-partisan research—at legislative direction—on issues of importance to Washington State.” It has policy analysts and economists on staff, and provides high-quality research to answer legislative questions.